Anyone who knows me will tell you, I am a passionate photographer. It is very rare that you will find me without a camera in my possession! I have amassed so much knowledge over the years, from the very basics of taking my camera out with me each time I worked as a park ranger, to moving in to the more adventurous of cameraman roles and duties whilst filming wildlife. If there’s one thing I know for sure, it’s that photos capture the most beautiful of memories for so many of us. 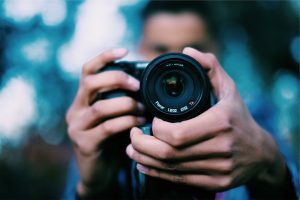 But, with so many of us now preferring to use the cameras on our mobile phones, it can often mean that we rarely lift our heads from the screen to take a real look at exactly what we are pointing our cameras at. That means the experience that you cannot buy or maybe never have again, is passing you by – and we are failing to see the breath-taking views and wildlife for ourselves in real time! Cameras must be one of the most perfect inventions, especially if you like to record your journey with pictures. By capturing our actions digitally, we can assure that we have memories that will last our lifetime and be passed down to our families, long after we no longer walk this beautiful planet. Whether staged or free fall photos, a picture can capture those perfect moments with clarity and colour, leaving us with a physical image of the day to remember for many years to come. Whilst taking a wildlife trek a few years back, there were three generations of one family together. Whereas the Dad and his younger Son had a camera and a mobile phone, the Grandfather had nothing of the sort. As we stopped for lunch, we sat in front of one of the breath-taking views and the grandfather took it all in and smiled. However, his Son and Grandson were both preoccupied with trying to set up their cameras. They were missing this once in lifetime opportunity. The Grandfather’s face said it all – and it made me sit up and take note. Ever since that day, I try to leave my camera at home a couple of times a week when we head out. Though it is great to be able to capture such events, there is no substitution for experiencing them away from the lenses on the odd occasion.